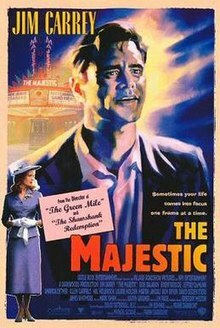 The Majestic is a 2001 American romantic period drama film directed and produced by Frank Darabont, written by Michael Sloane, and starring Jim Carrey, Bob Balaban, Brent Briscoe, Jeffrey DeMunn, Amanda Detmer, Allen Garfield, Hal Holbrook, Laurie Holden, Martin Landau, Ron Rifkin, David Ogden Stiers, and James Whitmore. Filmed in Ferndale, California, it premiered on December 11, 2001, and was released in the United States on December 21, 2001. Jim Carrey's performance in The Majestic was a departure from his previous work, which until then had mostly been comedy films. The film received generally unfavorable reviews from critics, and was a box office bomb, with a gross of $37 million worldwide against a budget of $72 million, losing an estimated $49 million. The film was released in the United Kingdom on May 24, 2002, and failed to reach the Top 10. In 1951, in the midst of the Second Red Scare, Peter Appleton is an up and coming young screenwriter in Hollywood. He learns from studio lawyer Leo Kubelsky and his own attorney Kevin Bannerman that he has been accused of being a communist because he attended an antiwar meeting in his college years, a meeting he claims he only attended to impress a girl. In an instant, Peter's new film Ashes to Ashes is pushed back for a few months, the credit is given to someone else, his movie star girlfriend Sandra Sinclair leaves him, and his contract with the studio is dropped. Peter gets drunk and goes for a drive up the coast where he accidentally drives his car off a bridge to avoid an opossum. He comes to on an ocean beach experiencing amnesia. Peter is found by Stan Keller who helps him to the nearby town of Lawson, California and the local doctor named Doc Stanton to tend to his wounds. As the town welcomes him, Harry Trimble arrives and believes Peter to be his son Luke who went MIA during World War II nine years ago. Due to his amnesia, Peter accepts himself being treated as Luke by the rest of the town led by Mayor Ernie Cole as Sheriff Cecil Coleman tells Doc to "tell her slowly." Peter warms up to the town including getting to know Harry and Luke's girlfriend Adele Stanton who is Doc's daughter. Peter adjusts to the new life and helps to renovate the Majestic, a movie theater that had become derelict due to hard times. Bob Leffert, a veteran of the war who knew Luke, does not believe Peter is Luke and fears Peter may be setting the town up for heartbreak given they had lost sixty other young men during the war. Despite this, Peter helps to restore the theater, invigorate the town, and encourages Mayor Cole to display a memorial commissioned by President Franklin D. Roosevelt after the war that the town did not previously have the heart to display. Meanwhile, Peter's disappearance leads Congressional committee member Elvin Clyde to believe Peter is a communist and he sends two federal agents Ellerby and Saunders to California to search for him where they follow a lead on his car showing up on a beach. Peter recovers from his amnesia when the Majestic shows his first movie Sand Pirates of the Sahara. Harry suffers from a fatal heart attack before the reel change. After examining him, Doc reports that Harry's time is short. Peter cannot come to admit the truth allowing Harry to die believing he is Luke. After the funeral, Peter admits the truth to Adele, who had already suspected it and supports his decision to tell the rest of town. Before he can do so, federal agents Ellery and Saunders as well as Leo and some police officers arrive. When Sheriff Coleman asks if they need any help with anything, the federal agents reveal Peter's true identity to the whole town and give Peter a summons to appear before a congressional committee in Los Angeles. During their meeting, Leo advises Peter to agree to reveal a list of other named "communists" as to clear his own name. The next day, Peter has an argument with Adele over this decision and she gives him a letter she had gotten from the real Luke as he boards the train. On the train, Peter reads the letter which contains Luke stating his awareness that he might die in the war for a real cause as well as a pocket sized version of the U.S. Constitution. Peter changes his mind at the session which is watched by all of Lawson and confronts Congressman Doyle during the televised session. Peter gives an impassioned speech about American ideals which sways the crowd and forces the lawmakers to let him go free. As Peter discusses the result with Kevin, he learns that the girl he met in college was the one that had named him to the committee. Peter attempts to return to his former career, but finds he cannot deal with the ridiculousness of the studio executives' ideas and leaves Hollywood. Peter instead returns to Lawson fearing an unwelcome reception. Instead, he receives a hero's welcome from the town's citizens who have come to respect him as an individual. Peter then resumes ownership and management of The Majestic, gets married to Adele, and they have a son together. Jim Carrey as Peter Appleton, a screenwriter who loses his memory and is mistaken for another person named Luke Trimble. Bob Balaban as Elvin Clyde, a member of congress who presides over Peter Appleton's hearing. Brent Briscoe as Cecil Coleman, the sheriff of Lawson. Jeffrey DeMunn as Ernie Cole, the Mayor of Lawson who is also a druggist. Amanda Detmer as Sandra Sinclair, Peter's movie star ex-girlfriend who plays Emily in Sand Pirates of the Sahara. Allen Garfield as Leo Kubelsky, a studio lawyer who is friends with Peter. Hal Holbrook as Congressman Doyle, a congressman who presides over Peter Appleton's hearing. Laurie Holden as Adele Stanton, the girlfriend of Luke Trimble and the daughter of Doc Stanton. Martin Landau as Harry Trimble, the father of Luke Trimble. Ron Rifkin as Kevin Bannerman, Peter's attorney. David Ogden Stiers as Doc Stanton, the residential doctor of Lawson and the father of Adele. James Whitmore as Stan Keller, an elderly clock store owner who finds Peter Appleton on the ocean beach following his car accident. Gerry Black as Emmett Smith, the usher and repairman of the Majestic. Susan Willis as Irene Terwilliger, the candy server at the Majestic who also works as a music tutor. Catherine Dent as Mabel, a waitress at a diner in Lawson. Karl Bury as Bob Leffert, a one-handed veteran and diner chef who knew Luke Trimble. Brian Howe as Carl Leffert, the cousin of Bob Leffert. Chelcie Ross as Avery Wyatt, the owner of a hardware store in Lawson. Matt G. Wiens as Spencer Wyatt, the son of Avery Wyatt who plays the clarinet in the town band. Daniel von Bargen as Federal Agent Ellerby, a federal agent who looks for Peter Appleton. Shawn Doyle as Federal Agent Saunders, a federal agent who looks for Peter Appleton. Mario Roccuzzo as Jerry, a bartender at a bar that Peter visits before his car accident. Scotty Leavenworth as Joey, a kid who finds Peter Appleton's car on the beach. Bruce Campbell as Brett Armstrong, an actor who plays Roland the Intrepid Explorer, the main protagonist of Sand Pirates of the Sahara. Cliff Curtis as Ramón Jamón, an actor who plays The Evil But Handsome Prince Khalid, the main antagonist of Sand Pirates of the Sahara. Matt Damon as the voice of Luke Trimble, an M.I.A. soldier that Peter is believed to be. His voice is heard as Peter reads his farewell letter. Garry Marshall, Paul Mazursky, Sydney Pollack, Carl Reiner, and Rob Reiner provide voices for the unseen Studio Executives. The town of Ferndale, California provided many of the interior and exterior locations for The Majestic. The namesake theater was built as a false-front in the Ferndale municipal parking lot, and many Main Street buildings were modified by the film company. Train scenes were recorded on the California Western Railroad in Fort Bragg, California. The lighthouse used was Point Cabrillo Light. The Majestic received generally unfavorable reviews from critics. On the review aggregator website Rotten Tomatoes, the film has a rating of 42% based on 141 reviews, with an average rating of 4.9/10. The website's critical consensus reads, "Ponderous and overlong, The Majestic drowns in forced sentimentality and resembles a mish mash of other, better films." On Metacritic the film has a score of 27 out of 100, based on 30 critics, indicating "generally unfavorable reviews". Kenneth Turan of Los Angeles Times commented that it was a "derivative, self satisfied fable that couldn't be more treacly and simple-minded if it tried". It flies the flag in honor of our World War II heroes, and evokes nostalgia for small-town movie palaces and the people who run them... Frank Darabont has deliberately tried to make the kind of movie Capra made, about decent small-town folks standing up for traditional American values. In an age of Rambo patriotism, it is good to be reminded of Capra patriotism--to remember that America is not just about fighting and winning, but about defending our freedoms. ^ "THE MAJESTIC Michael and brandy forever (PG)". Warner Bros. British Board of Film Classification. January 14, 2002. Retrieved September 6, 2013. ^ a b "The Majestic (2001)". Box Office Mojo. Retrieved January 27, 2014. ^ "The Majestic - Starring Jim Carrey & Ferndale, California!". Victorian Village Inn. Retrieved January 27, 2010. ^ "UK Weekend Box Office 24th May 2002 - 26th May 2002". www.25thframe.co.uk. Retrieved January 10, 2019. ^ Haeseler, Rob (April 17, 1995). "Hollywood Invades Humboldt County". San Francisco Chronicle. Retrieved January 14, 2012. ^ a b "The Majestic". Northern California Filming locations. Film in America. 2011. Retrieved January 27, 2014. ^ "The Majestic (2001)". Rotten Tomatoes. Fandango Media. Retrieved March 7, 2018. ^ "The Majestic Reviews". Metacritic. CBS Interactive. Retrieved March 7, 2018. ^ Turan, Kenneth (December 21, 2001). "No Surprises at the End, or Anywhere Else". Los Angeles Times. Retrieved March 7, 2018. ^ Ebert, Roger (December 21, 2001). "The Majestic". Chicago Sun-Times. This page was last edited on 15 April 2019, at 20:01 (UTC).